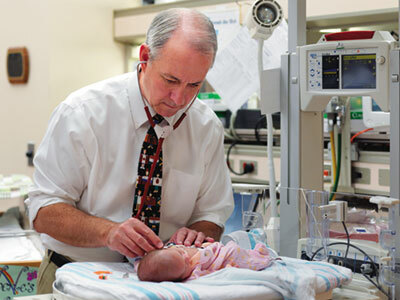 Neonatologist Richard Bell, M.D., examines one of his young patients in the NICU. Babies are notoriously unpredictable, especially when it comes to sticking to a due date. “Babies decide when they want to be born, when they want to eat or sleep, and even if they want to breathe or not,” says Deb Thorson, R.N., director of women’s and children’s services for NorthBay Healthcare. And while many new moms are happily planning for an anticipated birth day, some babies decide instead to arrive weeks and even months too early. When a Solano County baby is born prematurely, or is suffering a critical illness, odds are very good that the infant will come under the watchful care of the highly skilled neonatal nurses, neonatologists and respiratory therapists in NorthBay Medical Center’s Neonatal Intensive Care Unit (NICU). Here, a team stands at the ready to care for these tiny patients, whether they have been delivered by moms at NorthBay Medical Center, or transported here after birth at other area facilities, such as Sutter Solano in Vallejo, or David Grant Medical Center. “These babies come to NorthBay’s NICU because we have the highest level of neonatal care available in Solano County,” Thorson explains. “We are a Community Level III NICU, able to care for babies at 28 weeks of gestation and above.” If a baby is born at 27 weeks or less, or is sick enough to require surgery, however, the infant will be stabilized in NorthBay’s NICU and then transported to either Oakland Children’s Hospital or Sutter Memorial Hospital in Sacramento. “But, as soon as the infant has recuperated enough, and if he or she still needs neonatal care, the baby will be returned to NorthBay, so those babies can be cared for close to home,” says Richard Bell, M.D., neonatologist and medical director of the NorthBay NICU. “Anywhere from 9 to 12 percent of all babies born in the United States will spend some time in a NICU,” Dr. Bell notes, and that national average holds true for Solano County’s tiniest, or most ill babies. As many as 200 infants a year may spend their earliest days at NorthBay. These babies come to NorthBay’s NICU because we have the highest level of neonatal care available in Solano County. And, while a baby’s birth date may be unpredictable, the care that premature or critically ill babies receive at NorthBay is not. “We always have at least one bed open and ready for those unexpected deliveries,” Thorson says. Although the staff in the NICU is primarily focused on caring for their tiny charges, they also know it’s all about the family.